Seventy different floral designs of distinction were created and photographed to visually illustrate the “50 Techniques used in Contemporary Floral Design”. With Gill's expertise in floral design she explored the definitions used by both NAFAS and the florist industry and used her floral design expertise to create designs that depict Gill's interpretation. 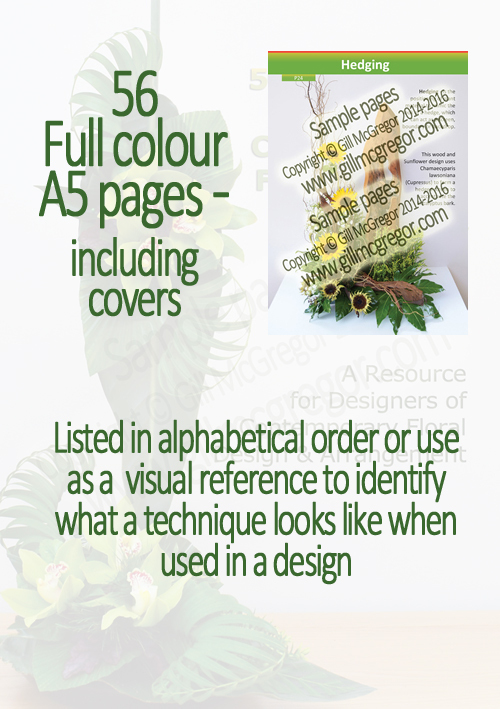 A flower arranging and floristry book written for experienced flower arrangers and florists and as a resource for students studying Contemporary floral design. By simply 'thumbing' through the pages you can look through the 70 different designs created for the book to perhaps become inspired to use a technique in your next design that gives it even more distinction. Otherwise step through the alphabetical ordering of the book and thereby use it as a visual reference to identify what a technique looks like when used in a design. 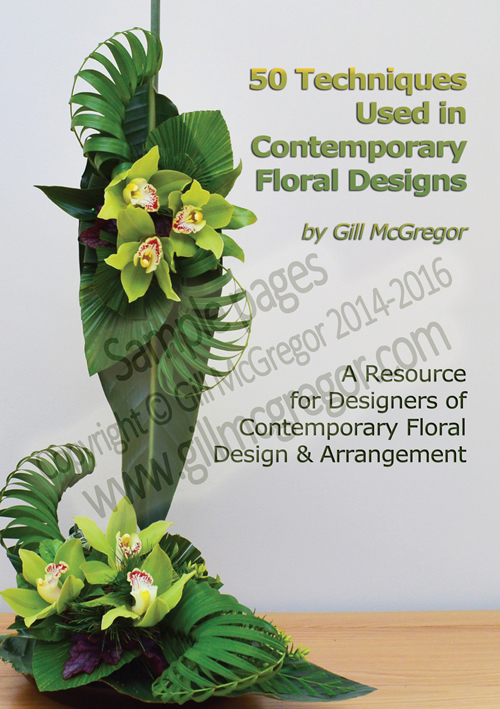 This book also includes photographic ideas of structures and containers which can be self made some of which are featured in Gill’s previously written “Contemporary Floral Design Ideas and Techniques” Booklets: six are from Booklet-2 and one is featured in Booklet-1. The Booklets provide colour photography of the completed design and a written description as to how it can be made. For the self made containers a collection of photographs are provided to further show the construction methods and are again supported by a comprehensive written description as to how they can be made. 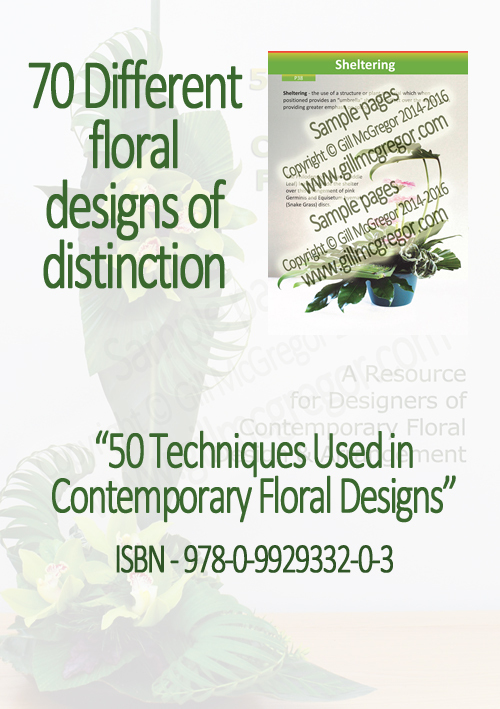 Seventy different floral designs of distinction were created and photographed to visually illustrate the “50 Techniques used in Contemporary Floral Design”. With Gill's expertise in floral design she explored the definitions used by both NAFAS and the florist industry and used her floral design expertise to create designs that depict Gill's interpretation. By simply 'thumbing' through the pages you can look through the 70 different designs created for the book to perhaps become inspired to use a technique in your next design that gives it even more distinction. Otherwise step through the alphabetical ordering of the book and thereby use it as a visual reference to identify what a technique looks like when used in a design. 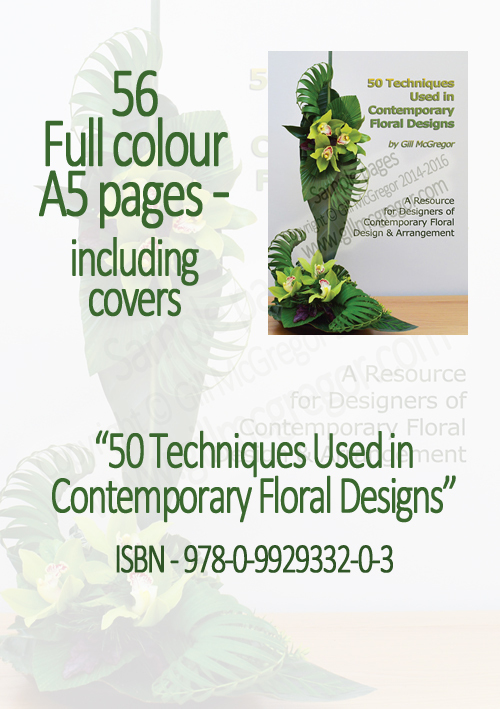 A flower arranging and floristry book written for experienced flower arrangers and florists, as a resource for students studying contemporary floral design, and for people wishing to expand their floral design skills. 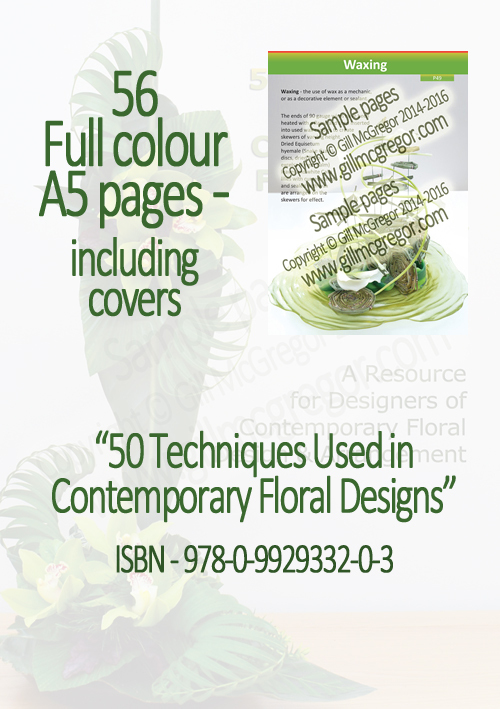 As an experienced Flower Arranging Teacher, Floristry Teacher and Flower Arranging Demonstrator Gill McGregor has specialised in Contemporary Floral Design and knows how important it is to include Contemporary techniques within floral designs to create Floral Designs with distinction - $17.99 + Untracked postage to Canada - other country's postage varies. 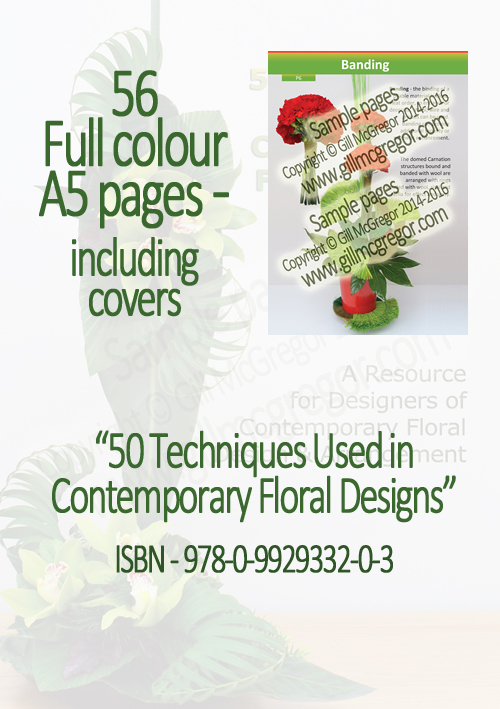 "50 Techniques Used in Contemporary Floral Designs". ISBN 978-0-9929332-0-3. 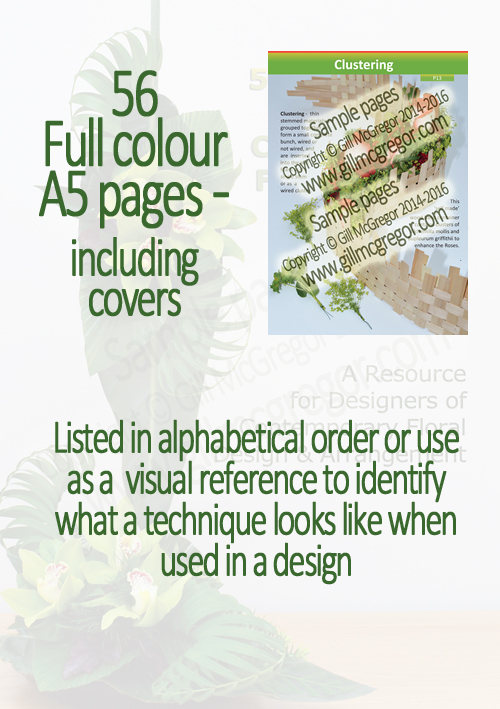 Full colour photography and supporting text, A5 portrait, 56 pages including covers.